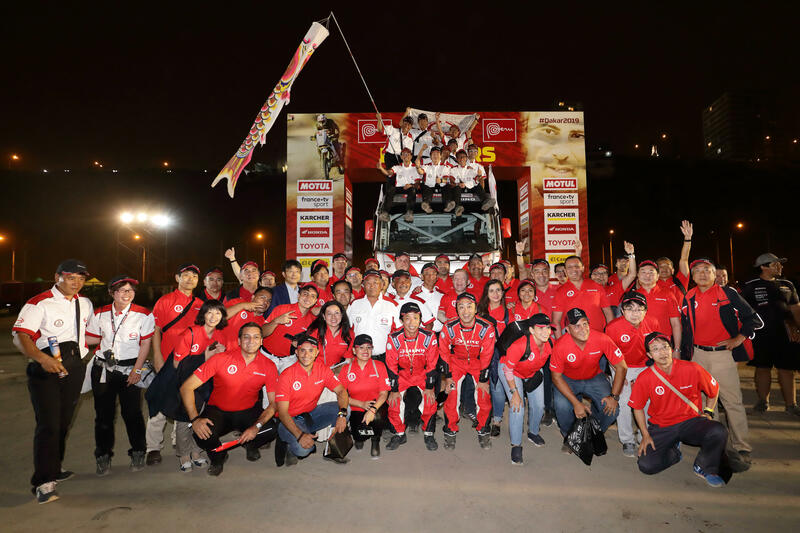 10th Straight Win in the Under 10-litre Class for HINO TEAM SUGAWARA in Dakar Rally 2019 Yoshimasa Sugawara extends his streak of Dakar starts to 36. Hino Motors, Ltd. (HQ: Hino-shi, Tokyo. President & CEO: Yoshio Shimo. 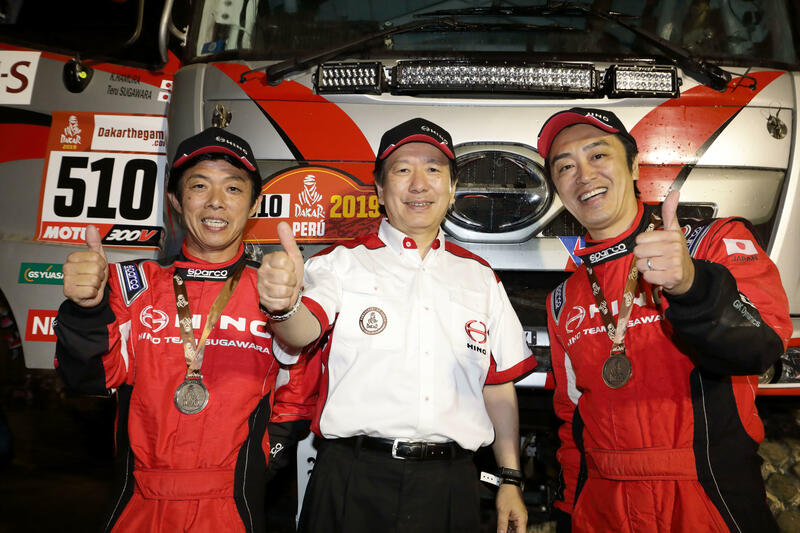 Hereafter "Hino") teamed up with Team Sugawara led by Yoshimasa Sugawara as HINO TEAM SUGAWARA, and entered two HINO500 Series trucks in the trucks category in Dakar Rally 2019. The rally was held from Jan. 6 thru 17, 2019 in Peru. Driver Teruhito Sugawara (46 years of age) won the class championship in the Under 10-litre Class of the trucks category, rewriting the team's record of straight Class victories to ten. Meanwhile, with the top group dominated by trucks running on engines with 10-litre-plus displacements, the medium-duty HINO500 Series truck was able to finish at 9th place overall in the trucks category thanks to Teruhito Sugawara's exceptional driving skills and wealth of rally experience. The HINO500 Series truck Car 2, driven by Teruhito Sugawara, clinched its tenth straight win in the Under 10-litre Class. Driver Teruhito Sugawara had this to say looking back at this year's event, "We fought on our new truck against the larger trucks who have consistently dominated the top group. While we did notice some new issues, we were also able to identify some areas where we could do things differently going forward. We can't stay in the game by merely aiming to finish the race just because the course was tough. I think we need to keep taking risks in our racing to make our way into the top group." 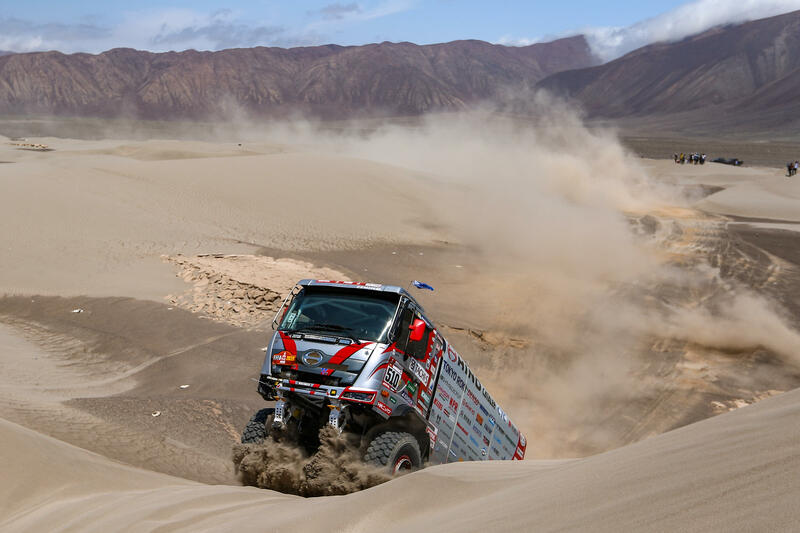 Driver Yoshimasa Sugawara (77 years of age), the "Ironman of Dakar," was forced to pull out early in the race in Stage 2 after his truck's steering system gave out. Yoshimasa Sugawara has been racing the Dakar Rally since his first stint in 1983 on bike in what was then called the Paris-Dakar Rally, and joined the Hino team in 1992. He has continued to race and extended his world record of straight starts in the Dakar Rally to 36. Driver Yoshimasa Sugawara remarks, "I'm very disappointed at having to withdraw from the race two years in a row. I am as grateful for all the support I've received as I am sorry for these results. That being said, I'm very glad that Car 2 won its tenth straight win in the Under 10-litre Class. That gives me some relief," applauding his son's performance. This year also marked Hino's 28th consecutive finish in the rally since 1991 when it became the first Japanese manufacturer of commercial vehicles to race the rally. Hino President & CEO Yoshio Shimo, who flew in to join the goal ceremony held on Jan 17 comments, "Our team delivered solid performance over tough terrain to clinch our tenth straight Class victory. This winning streak is certainly a win for the entire team. I would like to thank everyone for their hard work. It was too bad how things turned out for Car 1, but we look forward to how our driver Yoshimasa Sugawara does next year. We hope to make even more upgrades to Car 2 for next year's race. And we also hope to incorporate these experiences in the products we make." Hino president Yoshio Shimo celebrates with driver Teruhito Sugawara (right) and navigator Katsumi Hamura (left). By taking part in the world's top level race, Hino aims to share the excitement of racing with customers and motor sport fans around the world, and build on the spirit of challenge and technological capabilities honed through this experience to deliver products and services that benefit our customers as we strive to offer "Trucks and buses that do more." HINO TEAM SUGAWARA and supporters celebrate the team's 10th straight class win. 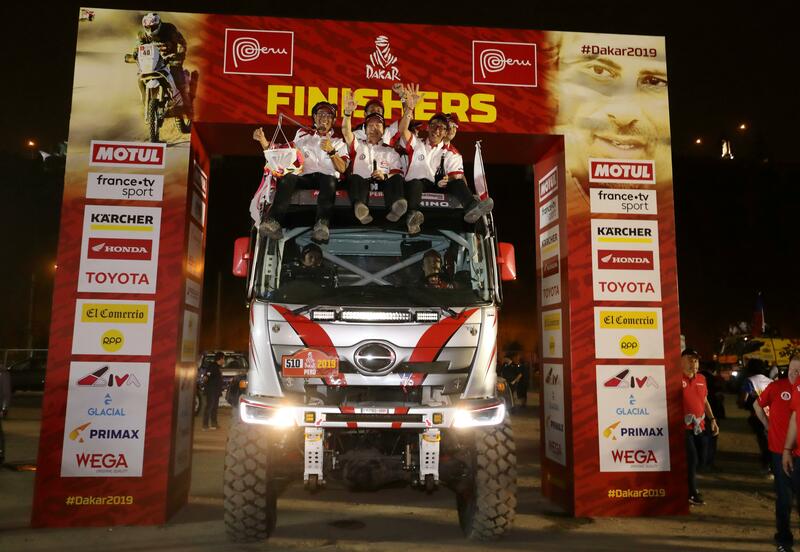 Please visit our official web site for details on Hino Motor's activities in the Dakar Rally. Photos included in this release are available for download at the site.